Why do I say this? I say this because what started out as a Rs. 13 Billion scam was quietly reduced to a Rs 9 Billion scam (and now to Rs. 8.4 Billion) and what started out as Rs 7.5 Billion recovered months ago (from the HSI owner, Sheikh Afzal alone — their are at least 17 co-accused) is now reduced to only Rs 5.6 Billion, right in front of the eyes of these courts and the judges are pretending not to have noticed. (For a complete background, see my previous posts — links at the bottom). The National Accountability Bureau (NAB) chairman has approved the plea bargain request of the major culprits of the Bank of Punjab (BoP) Rs 9 billion fraud scandal, giving them a clean chit to live a free bird’s life, The News has learnt. The executive board meeting of the NAB on Wednesday approved the plea bargain/voluntary return of 18 accused of the BoP scandal and settled the matter for Rs 8.4 billion, which is the estimated price of assets surrendered by Sheikh Afzal and others of the Harris Steel Mills. “The NAB will produce this deal along with other documents before the Supreme Court on Thursday (11-02-2010) and will follow directions of the apex court in this regard,” one of the attendants of the meeting said on condition of anonymity. Of course this whole ‘accountability’/’doing away with the NRO’ bit is a sham and we are being fooled by the court and the honorable judges. To show you what a crock it is, let me relate you the case of one NRO-beneficiary that I know personally. He ran away from the country about 10 years ago to avoid arrest. By his own admission, he managed to escape with Rs 19 crore (keep in mind this figure DOES NOT include the monies he left stashed here somewhere nor the value of the properties he bought with his ill-gotten gains). During these years on the run, he spent time in Dubai, New York, and Toronto. With the NRO signed, he came back to the country, got his son married to a rich doctor, but seeing the channged political scene (“it had become too corrupt” even for him), and with the NRO in doubt, he left the country againand went back to Dubai. Later I heard that he might be coming back soo as NAB was offering him a sweet deal: “Pay just Rs 3 crore and all will be forgiven!” (Remember he stole more than 19 crores and that too in 1990’s rupees when the dollar was around Rs 10). Well I was still suprised to run into him at the wedding last week (and seeing him shake the hands of Justice Ramday who too was present there did make me feel dirty so I avoided both). Surprised because I had thought with the NRO cancelled he certainly would stay away from the country but then I remembered that NAB offer and thought he must have paid up. Upon a later inquiry I was told nothing like that had happened. He was not even going to pay the Rs 3 crore because he said he didn’t see the need. Instead he was here because he WANTED to get convicted to get it over with. He says he will then appeal and is assured that process would be dragged for at least 20 years or more i.e. until he passes away (since this fella is past 60 years of age). So my friends, this is ‘justice’ and ‘accountability’ by ‘a free judiciary’ in this ‘land of the pure’!!! 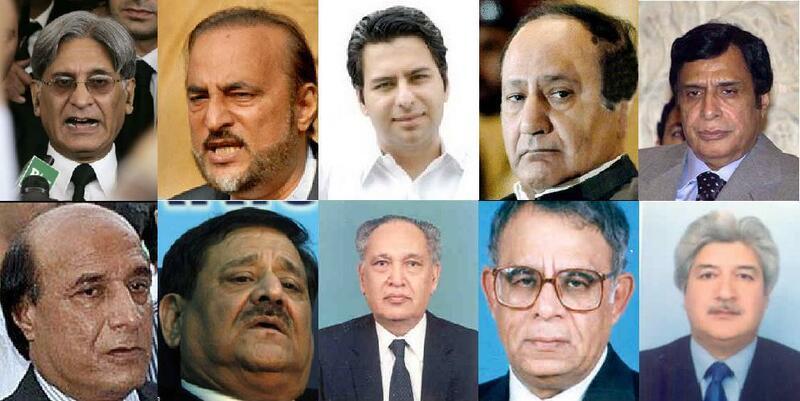 Chief Justice Iftikhar Muhammad Chaudhry has expressed annoyance over non-suspension of the NAB chairman, and termed it a sheer disrespect on part of the government of the verdict of 17-member bench of the Supreme Court. During the hearing of Harris Steel Mill case, the CJ remarked that under which law, bargaining has been made with the accused of the Harris Steel Mill scam. The counsel of Bank of Punjab told the court that so far around Rs 8 billion has been recovered in the fraud case, adding that NAB is cutting Rs 200 million as commission. 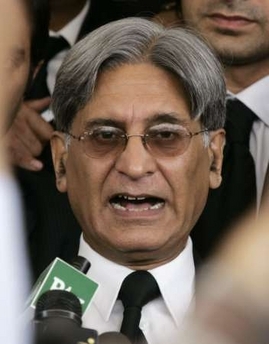 Recently columnist Haroon Rashid(HR) wrote an article on the games played by Aitzaz Ahsan(AA), confirming what has appeared on this blog (e.g. see here and here) and, as expected, Aitzaz was quick to respond to what he called “accusations” — I call them statements of facts — by HR. But in trying to clear his name by further telling lies, AA has only managed to confirm what HR and I have stated. Below are the so-called “accusations” by HR and the lies offered by AA as “clarifications”. him defending CJ resulting him in upping his fee up to rs 20 Million per case. Huh? Where did HR say that? What HR stated is right above. Can you find HR saying anything close to what AA claims HR said — and that too with a supposedly direct quote? Well, I certainly can’t. HR CERTAINLY DID NOT SAY THAT! Are we to assume a “brilliant lawyer” is so stupid as to not being able to copy one sentence? Most likely AA is doing this intentionally to twist things. But starting with this lie (“HR said I demanded fees”), AA goes into this long rant about all the occasions he had not charged fees from his corrupt PPP buddies for defending them in court and doesn’t shy away from having helped them get away with it. Hello! That is not HR “accused” you of and at least have the decency/sense not to make up quotes to suit your purpose. HR talks about the recent details that have come out about the LPG scandal in which consumers were bilked an extra 220 Billion. He tells us about 20-ton-a-day quota that AA enjoys. HR does say AA got the quota not because he is “a friend” of the LPG Mafia Don Iqbal Z Ahmed but because of Benazir Bhutto’s looking after her lap dogs. My! Is that the best defense you can offer, Mr. Brilliant Lawyer who charges Rs 2 crore per case? Amazing what bull you have been getting away with! Your first defense is now out the door as you have — belatedly but finally — been accused and the second defense just confirms the next accusation that you in fact were playing every side but the lawyers (the only side you were supposed to be playing). Also managing to secure such a lucrative deal (netting AA anywhere between Rs 3 million to Rs 38 million per month) admittedly due to nepotism — and not qualification — itself speaks volumes! AA puts up a false claim that some “All Pakistan Lawyers Representaives” organization (is there one?) was “undecided” on dharna in May 2008 (first Long March) but had decided to do so in Jan 2009 (second Long March). Well Mr Aitzaz, if the lawyers were “undecided” in May 2008 as you yourself say, then who gave you the right to decide it for them? And if they had decided in it’s favor in Jan 2009, then again why did you announce it’s cancellation?? Aitzaz follows this crap with some silly excuses for him acted that way. He says it was too hot in June (is that a revelation or is June always hot?) and the guys in black coats (lawyers) would have suffered (Oh, and they did not suffer during the Long March when the sun was out but would have suffered more say at 3 in the morning?). Next he says he cancelled it because he was afraid some lawyers would have attacked the parliament and would have been arrested and no one would have bailed them out (Oh, so the lawyers were so helpless and alone?). Next he adds he did it for the women and kids who were present who would have suffered (Oh thanks AA for being so caring — we know women have no sense to make that decision for themselves or their kids). But AA is not done yet. Then he adds that anyone not supporting his decision were in fact agents of the forces wanting to do away with democracy (ignore the fact that Mush the dictator was sitting in the presidency) and those who wanted to spill blood and guts — another pathetic ‘excuse’. HR talks about the time AA took CJ to meet Zardari under the pretense “to offer condolence for the death of Benazir Bhutto”. Of course it was a senseless move and a lot of fingers were pointed at CJ and HR rightly wonders if the real purpose behind it was AA trying to raise his rate. AA goes into another rant against being called greedy and opportunist and gives us a list of qurbanis (how could a jiyala not shout qurbani when he has no legs to stand on — in fact you know he has trying to divert from the issue at hand) he gave like “I turned down the PMship”, blah, blah, blah. But in all of that rant, he, of course, makes no mention of his rate having skyrocketed (his opportunism already proven by the BoP and the LPG affairs alone). So what do you think? 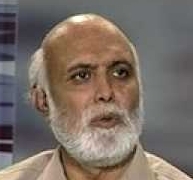 I score it 4-0 in favor of Haroon Rashid. So much for “free judiciary”! Appears the Bank of Punjab Scam is all set to be swept under the rug along with other such scams not even getting a mention. Recently Bank of Punjab (BoP) scam that I talked about in ‘Aitzaz Exposed – Part II‘ (read it to get some background of the scam) has been back in the news as the Supreme Court has been actively perusing it. But what I found most curious is the fact that although it was a Rs 13 billion scam, ALL (but one) news stories have been referring to as only a Rs 9 Billion scam. The scandal broke around April/May 2008 when NAB arrested ex-BoP president, five GMs. LAHORE: The National Accountability Bureau (NAB) has arrested Hamesh Khan, the sacked chairman of the Bank of Punjab (BoP), and five former general managers of the bank on massive fraud charges, sources in the bureau told Daily Times on Sunday. Haroon Aziz, Khalid Qayyum, Amir Mumtaz, Muhammad Hussain and Amir Ifitkhar have been named as the five arrested former BoP general managers, the sources said. According to Geo TV, an internal audit of the BoP disclosed a fraud worth Rs 13 billion during the previous government’s tenure. It said the case was referred to the State Bank of Pakistan, which sent it to NAB for further investigations. The channel added that NAB sources had confirmed the fraud, saying that the BoP administration had issued heavy loans against ordinary property. It has been learnt that Hamesh’s arrest came after Sharjeel Masood, a senior BoP officer and right hand man of Hamesh, informed authorities of the latter’s activities. The sources said the officials had been under NAB detention since Thursday. They added that former Punjab Secretary Salman Siddique and the former Finance secretary would also be investigated in the case.